Yep, you read that right, two granola recipes in one week. LOL Some may say I am consumed with this new found freedom of making my own…and you would be right! The possibilities are endless. I can't wait to make the next batch and I have barely started with this new one. For this version I wanted to try chocolate. I had a few dark chocolate chips left over from making the Jaffa Cakes. As I was putting it together, it reminded me of a no bake cookie…only I used some different sweeteners like honey and maple syrup. As I was eating this latest version I felt like I was eating Chocolate Pebbles Cereal. 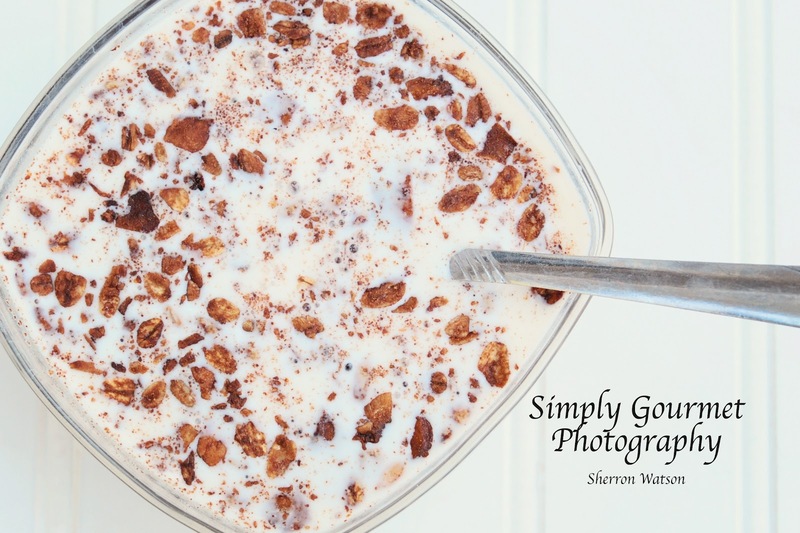 The little oatmeal flakes floated to the top of my bowl and my milk turned light brown. 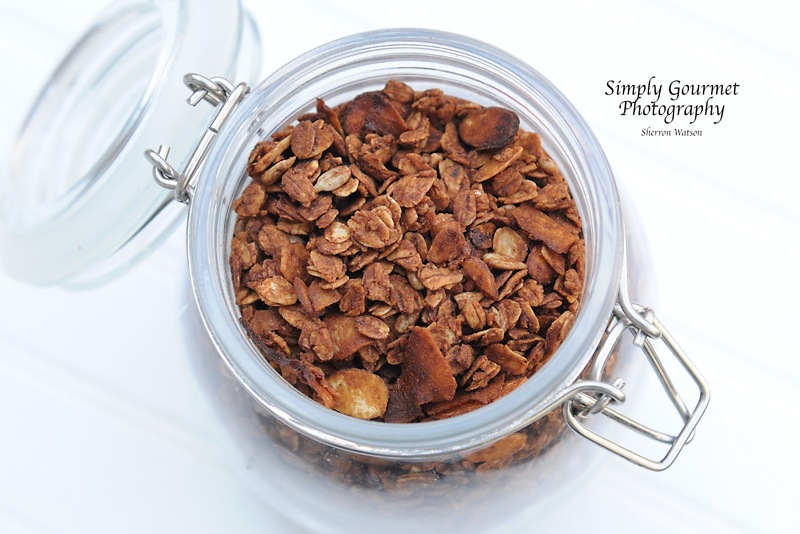 I thought…could I make a Fruity Pebble flavor granola using different flavorings….my mind was on fire! LOL I will have to think long and hard to decided if I want to duplicate that very sweet cereal into a granola. It some how doesn't seem right, but then again, it may be awesome too! 2-4 T. peanut butter…the more you use the stronger the flavor. 1/2 cup of dark chocolate chips, I used Ghirardelli 60% chips. In a large bowl mix the first 4 ingredients. You can add other ingredients or substitute other things for what I have used. Just try to keep measurements the same. In a small pot, bring the honey, maple syrup, peanut butter, vanilla and EVOO to a warm temperature…it does not have to boil. Once the sauce is warm you can add the chocolate chips and stir to melt the chips. Remove from heat and add to dry mix. Stir well together to coat ALL of the oats and nuts. Spread mix onto a large cookie sheet and start to bake. The total bake time is about an hour. You will need to stir the granola every 10 minutes. 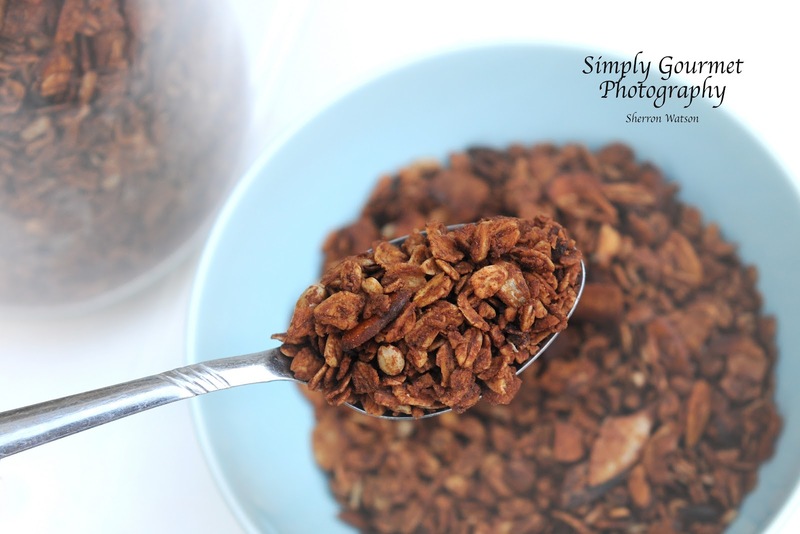 If you do not stir, then you risk the possibility of burning a portion of the granola. Let the granola cool and store in an air tight container. 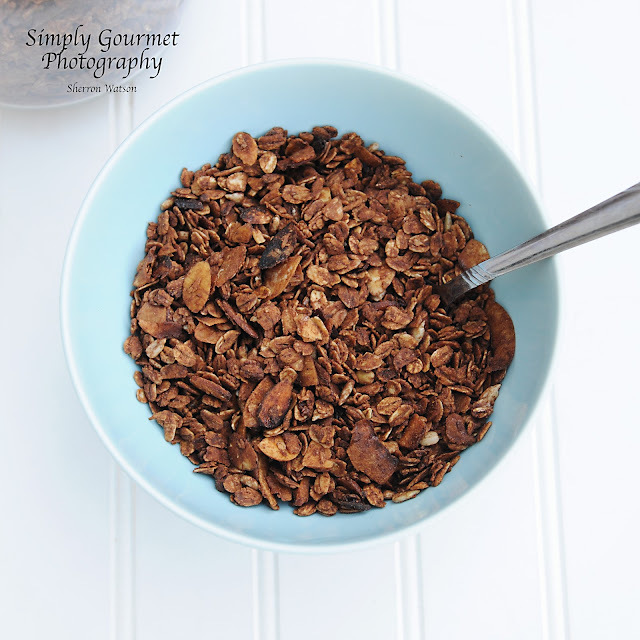 Chocolate Peanut Butter Granola? That sounds like a great way to start the day! Oh Spencer it is sooo good! LOL In fact, as I write this, I am enjoying a yummy bowl. Granola twins is a great name! I know she has some great recipes too…I need to try on with added fruit too. Have a great day Ann! This looks and sound so good that I'm making today! I have one question, is the oatmeal the 100% or quick coking time? Hi Amy, I use the regular Quaker Oats oatmeal in the big tub. I have never tried it with the quick cooking oatmeal so I am not sure if it would turn out or not. I just had a handful of mine and it taste great. I am excited to hear how you and your family like it. Have a fantastic day!